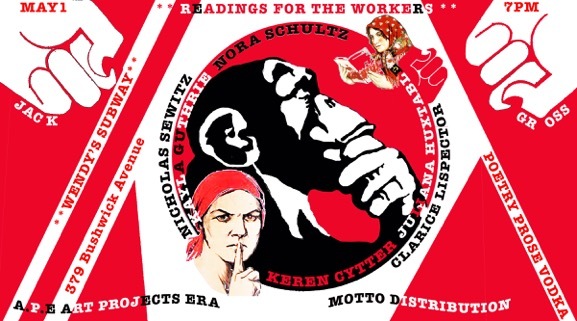 MOTTO DISTRIBUTION » Blog Archive » “Prose and poetry reading for the working class and other laborers.” Contributors: Nora Schultz, Kayla Guthrie, Nicholas Sewitz, Clarice Lispector, Juliana Huxtable, Keren Cytter. 01.05.2016, 7 pm @ Wendy’s Subway, Brooklyn. This entry was posted	on Wednesday, April 27th, 2016 at 3:00 am	and is filed under 2016, events, poetry, politics. You can follow any responses to this entry through the RSS 2.0 feed.